Ruth Robertson and her grandson, Landon Madill, 7, Topeka, pick through the rubble at the Robertson’s former home in Joplin, Mo. 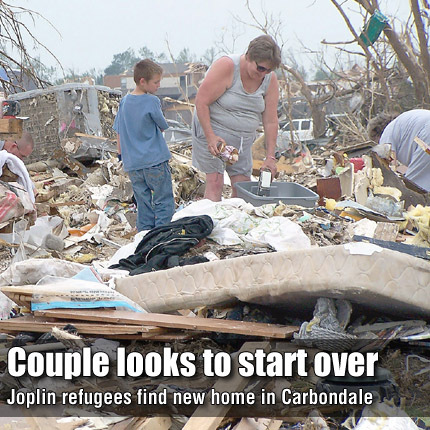 CARBONDALE—A Joplin, Mo., couple is on their way toward a permanent home, two months after a tornado destroyed their duplex and everything they owned. The May 22 EF5 tornado in Joplin leveled the home of Ruth and William “Bill” Robertson, who are both disabled and living on Social Security. The Coffeyville natives hope to enjoy small town living close to family in Topeka, and have made plans to relocate to Carbondale. Having narrowly survived the storm, they feel lucky for the opportunity.